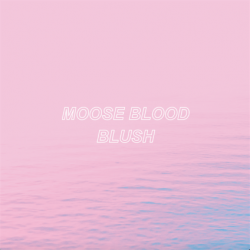 English emo punks Moose Blood release their sophomore album Blush on 5th August via Hopeless Records. Building upon the formidable foundations of their 2014 debut I’ll Keep You in Mind, From Time to Time, this is the album that sees things click perfectly for Moose Blood. Where their debut excelled this propels the band onto another level. This is moment that Moose Blood become essential. Blush has the definitive sound of Moose Blood, it brings back the happy memories of hearing them for the first time, but also pushes their sound on. This time it’s a little more adult and refined, think of their sound progressing in the nature of Brand New but retaining a little more of the infectious emo punk that made them so special. There’s not a single dud on Blush either. Hell you get the feeling that this is going to be special from opener ‘Pastel’ alone. The rousing and commanding presence to lead singles ‘Honey’ and ‘Knuckles’ are testament to just how good this album is. You’ll notice the strides towards a more positive and upbeat sound, ‘Glow’ and ‘Cheek’ are two moments when it’s really striking and as such these tracks standout as some of Moose Blood’s best material. Bookending those tracks you’ve got the fragilely wrought ‘Sulk’ and majestic ‘Sway’. The latter has hints of Midwestern emo with a pop swagger; it has all the hallmarks of a big hit for the band. It is the track that could send them stellar. The emotion is ramped up on the beautiful and heart-breaking ‘Shimmer’ before ‘Spring’ gives your heart another cruel twist and you’re left and emotional wreck. While some may consider both to be run of the mill emo tracks, you get help but to be affected by Eddy Brewerton’s delivery. It’s the earnest raw emotion that makes it relatable and on-point. In feel with the rest of the album, closer ‘Freckle’ restores some positivity. While there still may be sentimentality to the lyrics, the music has a real summery and upbeat sheen that makes grinning nigh on impossible. Blush is one of those genuinely magic albums that only come around once or twice a year, one that can give you the chills and encapsulate so many emotions. Moose Blood have pulled this out of the bag. Superb.